Kabul (AFGHANISTAN) (AFP) - Abdul Rasul Sayyaf, a former Islamist warlord who trained the mastermind behind the 9/11 attacks, enters Afghanistan's presidential election race, triggering alarm among Western diplomats. KABUL, Afghanistan — The C.I.A.’s station chief here met with President Hamid Karzai on Saturday, and the Afghan leader said he had been assured the agency would continue dropping off stacks of cash at his office despite a storm of criticism that has erupted since the payments were disclosed. The C.I.A. 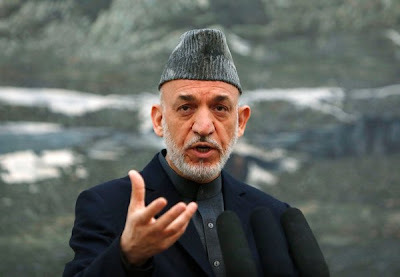 money, Mr. Karzai told reporters, was “an easy source of petty cash,” and he suggested that some of it was used to pay off warlords and power brokers. The use of the C.I.A. cash to pay those people has prompted criticism from many Afghans and some American and European officials who complain that the agency, in its quest to maintain access and influence at the presidential palace, financed what is essentially a presidential slush fund. The practice, the officials say, effectively undercut a pillar of the American war strategy: the building of a clean and credible Afghan government. CIA 'Ghost Cash' Effect: Is US main source of Afghan corruption? It is striking how closely the Obama administration is following the Iraq withdrawal playbook in Afghanistan. There are numerous and important differences between Iraq and Afghanistan, but President Obama is making the exact same policy choices to "wind down" the war in Afghanistan that he made in Iraq. And in both cases, it amounts to writing off the war. 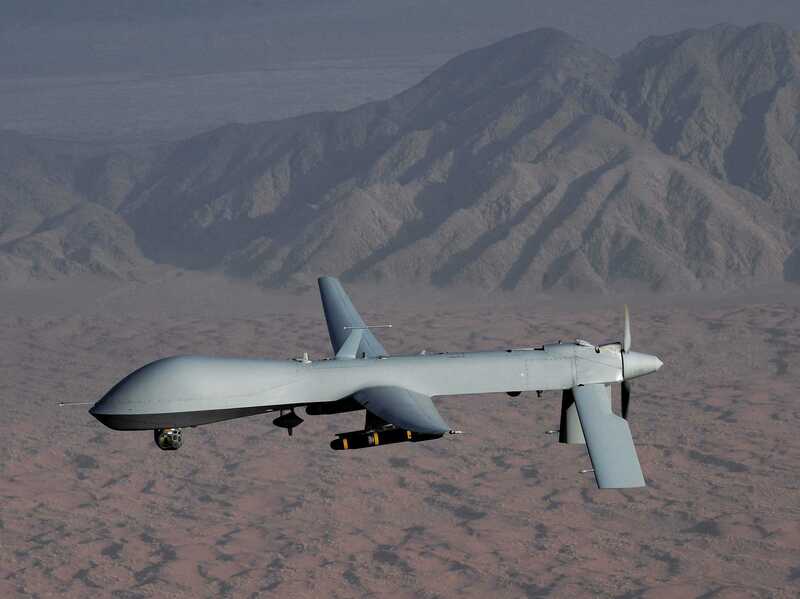 The Obama administration hasn't had a strategy in either war, it has had a military strategy. In both cases, that military strategy produced military gains; in both cases those military gains were ephemeral because advances were in no way supported by political or economic lines of operations to consolidate and capitalize on our military success. The State Department's grand plans for the transition to civilian activity in Iraq are in ashes. If there was a "civilian surge" in Afghanistan, it was completely ineffectual. In both cases President Obama had a political strategy grounded in the belief that leaders in those countries would not make the politically difficult choices needed unless faced with the imminent end of our support. Thus the timeline-driven exit in both cases. In Iraq, it resulted in a mad scramble for political control: the stalemate over Parliamentary elections, Prime Minister Maliki using the apparatus of the state to punish political adversaries. That mad scramble has been underway in Afghanistan and the region since President Obama announced in December 2009 our withdrawal from Afghanistan, and most evident in the hedging choices of the government of Pakistan, without whose collaboration our strategy could not succeed. In both cases President Obama doubted the efficacy of a surge of troops: on Iraq he insisted the surge couldn't work, on Afghanistan he set a time limit and reportedly told military commanders this was all they were getting. If they couldn't produce a victory in that time, he would wind down our involvement. In both cases, President Obama publicly declaring our withdrawal created a political dynamic in which leaders had strong incentives to make us look pushed out; otherwise they would look abandoned, weakening them domestically. Thus Maliki's resistance to immunity for American soldiers; thus Karzai's cavalcade of anti-American statements and actions. Their resistance feeds into the president's belief that they are undeserving of our sacrifices, and best left to their own fates instead of coached and set up to be successful. President Karzai said after meeting President Obama that "numbers [of American troops] aren't going to make a difference in Afghanistan." Expect President Obama to give that theory a test. In both cases, our exit bore no connection to achievement of our objectives. In Iraq the timeline was supposed to allow for a stable political transition. Manipulation by Maliki of the outcome of spring 2010 Parliamentary elections seized up politics in Iraq for a year and a half while our drawdown proceeded apace and Generals Odierno and Austin disavowed any connection between our withdrawal and political fracture. In Afghanistan, the Obama administration has trumpeted building security forces that can undertake the crucial work Americans have been doing. The December 2012 Pentagon report on Afghan security forces concluded that only 1 of 23 Afghan brigades can operate without our support. If achieving our objectives mattered to President Obama, that information should prompt a serious review of our timeline -- and extend it. Instead, he has accelerated our disengagement. In both cases, the military advised more troops, more time, and broader objectives than the president accepted. It is the job of military leaders to provide the president their best military advice -- but warfare is a political undertaking, and the military cannot be expected to decide how much national effort to put toward the wars we are fighting. It is above their pay grade. We elect presidents to do that, and only they truly have the span of authority to make the trade offs between defending our country and other important endeavors. But that means blame for the outcome also belongs with the president and not the military leaders. In both cases, President Obama instituted an end to military operations more than a year before the withdrawal of our military forces. 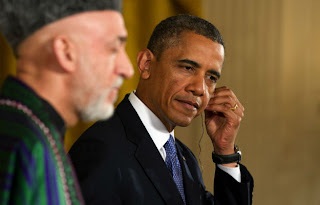 In Iraq it was the August 2009 "end of combat operations;" on Friday, President Obama announced U.S. forces in Afghanistan would this spring limit themselves to supporting Afghan operations; by 2014 they will be limited to training Afghan forces. This effectively ends the practice of counterinsurgency. We will no longer protect Afghans, be dispersed throughout the country, or operate alongside Afghan military units. We're shrinking back onto a couple of large military bases that will protect us against attack ... and also against having an accurate intelligence picture to fuel those counterterrorist operations. In both cases, President Obama has carried out the policies in slow motion, allowing months of news coverage about pending changes and options considered, such that when policies are implemented, they don't seem like news. Opponents have a harder time mobilizing support when there isn't an actual policy to counter, and by the time there is a policy, the public feels like they've heard this all before. It's the frog boiling strategy: make it happen slowly enough that we'll hardly notice. 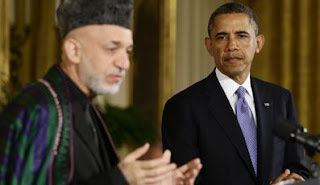 Executing the Iraq playbook in Afghanistan will replicate the squandered Iraq gains in the war President Obama argued needed to be fought because he was "convinced that our security is at stake in Afghanistan and Pakistan" as it was not in Iraq. Does President Obama genuinely expect a different outcome? Does he no longer believe the dire stakes that prompted his Afghanistan surge are at issue? Does he believe achieving our objectives is not worth the price? Does he believe America can buffer itself against a chaotic and dangerous world? Does he believe the wars he has prosecuted as commander in chief are unwinnable? If so, why has he allowed them to exact the terrible toll of lives lost? 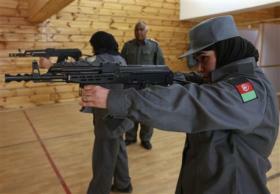 A woman in an Afghan police uniform shot and killed a NATO contractor in the Kabul police headquarters early Monday morning, authorities said. Officials have not yet confirmed whether the woman was indeed a member of the Afghan police force, said Sediq Sediqqi, a spokesman for the Afghan interior ministry. She was arrested. The victim was a civilian contractor for ISAF who was working as an adviser to Afghan police, said Major. Martyn Crighton, a spokesman for NATO's International Security Assistance Force. A British soldier serving in Afghanistan has given birth to a baby boy at a NATO compound attacked by the Taliban just a few days earlier, the U.K. government confirmed Thursday.